I've written about my past with an eating disorder, body image issues, being vegetarian, being healthy, and many more health-related issues. Parts of these things are natural and just part of being a 20-year-old girl with control issues, but part of it comes from being a part of a family that loves food and loves good food. And I've never been as proud to publish something as I am to publish this post by my dad. Over the past few months, he's lost so much weight after never being able to think he could do it, and I'm so stinking proud. On December 31st, 2015, a series of doctor visits culminated in the doctor recommending me to utilize a sleep apnea CPAP machine due to being significantly overweight. If I didn’t want to go on the CPAP machine, I would need to lose a bunch of weight. I needed to get my Body Mass Index (BMI) from a 34.4 (Obese Class I) to a 24.9 or less (normal range). He suggested a book and gave me a tip of evaluating all food he was considering on a nutrition scale. The food evaluation scale resonated for me. The doctor informed me that a very small percentage of the people were able to achieve this type of weight reduction. I left his office on the last day of 2015 with the resolution of proving him wrong. This wasn’t the first time I have tried to lose weight over the years. I have been on and off many programs with limited success. Struggling to sustain was always a problem. If it had only been my doctor visit as motivation, I’m not sure that would have been enough. Two other factors played a major role. The ability to better manage my stress levels has helped. I have always been a stress eater. Over the past year, I have worked with a coach to help me manage stress. This has been a tremendous benefit. The final factor was the loss of my father-in-law, Jim Smith, a year and a half earlier. He is one of the finest people I have ever known. When people talk about servant leadership, he is the person they are describing. I have never known anyone else to sacrifice as much as he did. He lost his battle with Amyloidosis, a rare blood disease, in June 2014. With my own mother and father passing away previously, his death was a wake-up call to me about my family depending upon me. I will never be able to compare to Jim Smith, however improving my health was something I needed to do not only for myself but my family as well. January 1, 2016, Day One: 282.6 pounds. As background, I’m 48 years old male, 6’ 4”. I have been asked several times which diet program I used. I have been on different programs in the past including Weight Watchers which I believe is one of the best. This time, I didn’t use a formal program. I believe one of the keys is write down everything you eat. I used the app, MyFitnessPal. In past diets, I have done this with varying degrees of success. This time, I have been very diligent with it, perhaps overzealous. You can’t manage what you don’t measure. 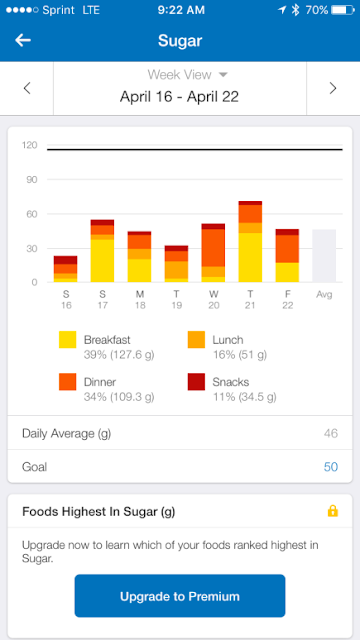 My goal was to stay between 1900 – 2100 calories per day. For the most part, I have been able to do this. The one key difference for me was a focus on the type of food I ate. Thinking about the doctor’s advice, I evaluated all the food on its nutritional value. I transitioned from eating a large amount of red meat to primarily poultry and fish. For the first few months of my lifestyle change, I ate red meat about once per week. For the best few months, it has been about once every couple of weeks. I realize that I really enjoy fish. I also reduced salt, fried foods, processed food, soda and alcohol. In their place, I eat a ton more vegetables and fruit. My wife, Marta, makes an awesome stuffed zucchini boat (stuffed with mushrooms, onion, zucchini, garlic, and cheese). The one item in my lifestyle change I have been most diligent about cutting out is added sugar. Everything I have read says added sugar is one of the worst things for you. Added sugar contributes zero nutrients. A good website I recommend is the American Heart Association. Having a father who died of diabetes has an added impact to me in this area. I still have plenty of natural sugar with the fruit I eat. I’m proud to report I haven’t had dessert (with added sugar) since January 5th. I missed it at first, however now it really isn’t a big deal. I plan to continue to skip dessert. There isn’t anything wrong with dessert occasionally. It just works for me. I like the challenge. I travel a significant amount for my job. It definitely makes it tougher on my lifestyle change, however, I haven’t let it be an excuse for me. For snacks, I travel with almonds and pistachios. Even though they don’t taste as well, I get the unsalted variety. Almonds are a great travel snack. I always carry a zip lock bag full of them. I also eat lots of eggs. It is always three scrambled eggs with cheese sprinkled on top. At first, I was eating egg whites, but with my cholesterol okay, I go with whole eggs. I try to stay in hotels, such as the Hilton Garden Inn, where I can get eggs cooked to order. My wife, Marta, has been a great support for me. She has been very accommodating on the meals. We have found great salmon and tilapia marinated in a variety of sauces just from our normal grocery store, Kroger. Kroger packages the fish in a wrapper that goes directly in the oven, making clean up very easy. Marta and I both got FitBit Charge HRs in December. They have been great motivation for exercise. Being able to track your steps on a daily basis is very helpful. We have linked our FitBits to the MyFitnessPal app. We started walking at the YMCA during the winter and now have moved outside with the warmer weather. Travel can make exercise difficult. I try my best to walk whenever I can. Time permitting, I will walk through airport terminals as opposed to riding the train or taking the moving sidewalk. I find myself really missing exercise when I don’t get the chance. Eating healthy isn’t cheap. Although I haven’t done the calculation, I know we are spending more at the grocery. Buying more fresh food and less processed food costs more, however, I look at it as an investment. The healthier I am, the more productive, income-generating years I will have. I also expect my health care costs to be lower. It is a great return on my investment to spend more now for a much higher return later in life. I set three weight loss goals – 50 pounds, 60 pounds, and a stretch goal of 70 pounds. For the past 12 years, my weight has been in the 260 – 285-pound range with an average around 275 pounds. Losing 60 pounds would take me to a weight I was in 2002 when I ran the Cincinnati Flying Pig marathon. Losing 70 pounds would get me to the weight I was in 1985 when I was a senior in high school and it would also get me to the normal range of the Body Mass Index (BMI) scale. Day 167, June 15, 2016. I’m proud to report I have lost 57 pounds. It is amazing how much better I feel. The minor aches and pains have gone away. I sleep much better as well. I track my sleep very closely via FitBit. I am able to wear the suit I wore at my wedding rehearsal in 1993. What a great feeling! I went to the doctor a few weeks ago and he was shocked, amazed, and very pleased. As I look to the future, my determination remains strong to get to a loss of 60 pounds and 70 pounds. Once I reach the70-pound loss threshold, there will be a new challenge on maintaining. I feel my journey has been about a lifestyle change rather than just a diet and that mindset will greatly assist in sustaining. Stay tuned! I could cry tears of happiness at how proud I am of my dad. I also just want to emphasize that this isn't something that's out of the blue with anything fancy. He is gone in a different city every single week without being able to go to a fancy gym, cook a ton on his own, and he works more than anyone I've ever known to. He stays his frugal self and understands that even though buying fresh groceries may be a little more expensive, it's best in the long run. I'm so proud to call him my dad! These blogs are valuable because these are providing such informative information for all the people does phen375 really work. Body cells ingest these from our every day consume less calories. On the off chance that your every day eating regimen is unequipped for giving the above fundamental components, you require men's wellbeing supplements. These blogs are valuable because these are providing such informative information for all the people site recommends. Amazing work pals, I really enjoy reading your interesting blogs gym pros. Once you have determined approximately how many calories your body requires to operate, reduce you calorie consumption to 500-700 calories less than that without going under 1200 calories. More than a 700 calorie deficit may lead to muscle loss which is the next cause of a weight loss plateau.
. Indeed, even after accreditation, you should registration at regular intervals and get a re-affirmation. National College, Everest College and US Career Institute are recorded among the best 10 best Pharmacy Tech Schools. The time it takes for you to see (and others to see) weight reduction results can fluctuate from individual to individual. Numerous elements, including your beginning size and your eating plan, can have a major effect. When all is said in done, be that as it may, numerous individuals can get results in one to about fourteen days in the event that they adhere to their arrangement. References - Paul, S., 2018. Oyster Extract Testosterone Scientific Studies: Benefits, Dosage & Side Effects! [WWW Document]. Testosteroneofficial.com ie. Testosterone Official. URL https://testosteroneofficial.com/research/oyster-extract/ (accessed 12.4.18). The present study shows the beneficial effects of a long-term ketogenic diet. It significantly reduced the body weight and body mass index of the patients. ... Therefore, the present study confirms that it is safe to use a ketogenic diet for a longer period of time than previously demonstrated. the health fitness is most important. The supplements are dietary supplements commonly used by those involved in bodybuilding, weightlifting, mixed martial arts, and athletics for the purpose of facilitating an increase in lean body mass. The intent is to increase muscle, increase body weight, improve athletic performance, and for some sports, to simultaneously decrease percent body fat so as to create better muscle definition. discover more. Nice blog about the better health and weight loss yes its a need of human life because good health and fitness is the most important of good life our website. Hey Very Nice Blog! Thanks For Sharing Click here.